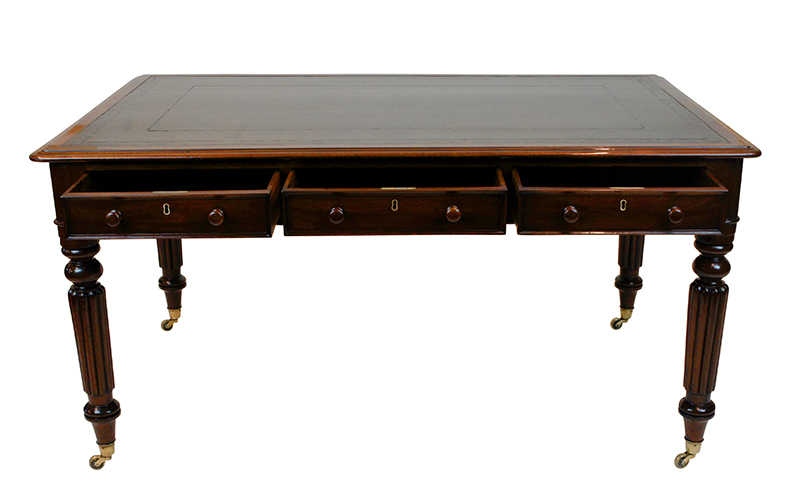 This well-proportioned William 1V antique partners writing table or library table / desk is in excellent condition having been recently cleaned and polished. It has a beautiful old (possibly original) faded black hide with blind tooling. The fading brings out a tan colour beneath which looks very unique. The writing hide is surrounded by a band of Mahogany with a 'thumb moulded edge' and rounded corners. is in excellent condition having been recently cleaned and polished. It has a beautiful old (possibly original) faded black hide with blind tooling. The fading brings out a tan colour beneath which looks very unique. The writing hide is surrounded by a band of Mahogany with a 'thumb molded edge' and rounded corners. brass locks (with one key), ogee moulded edges and turned wooden knobs. 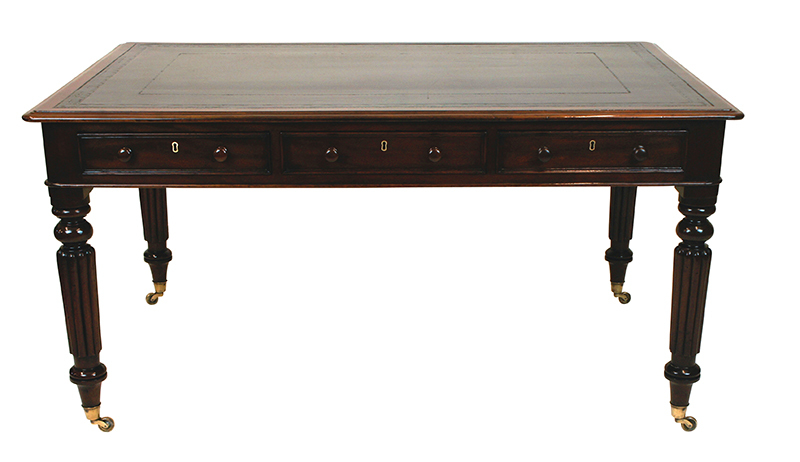 The table stands on four well turned slender reeded legs terminating in brass castors. 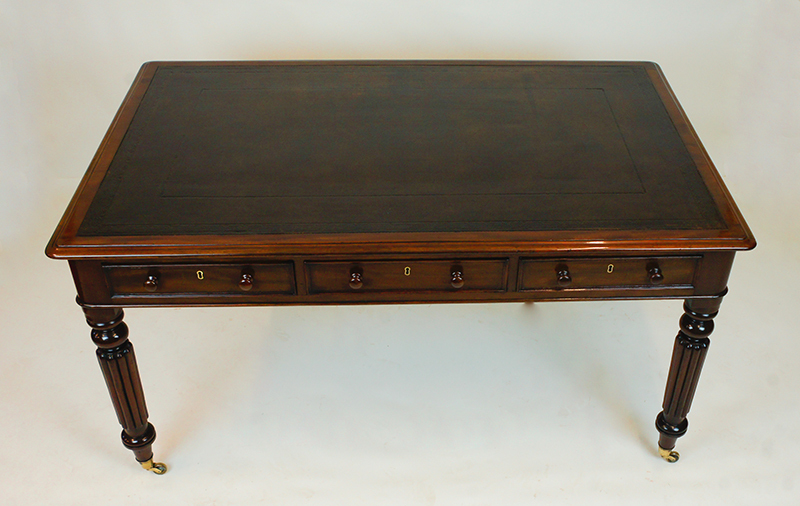 This is a well proportioned partners writing table or writing desk in excellent antique condition ready for use. 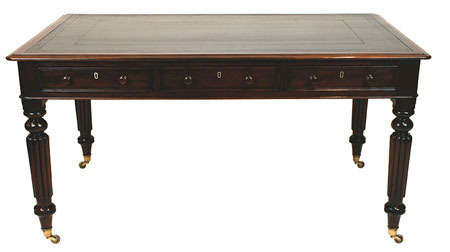 as they make excellent antique desks or library tables. They are perfect for use in any office, home study or library.